Get the buying power you or your team needs to shop now and not pay until 2019. Use PayPal Credit’s digital, reusable credit line to shop anywhere PayPal is accepted. Whether you’re buying the perfect lighted Christmas tree or purchasing your holiday string lights and/or decorations, You get 6 months special financing on purchases of $99 or more every time you shop with PayPal Credit. Subject to credit approval. 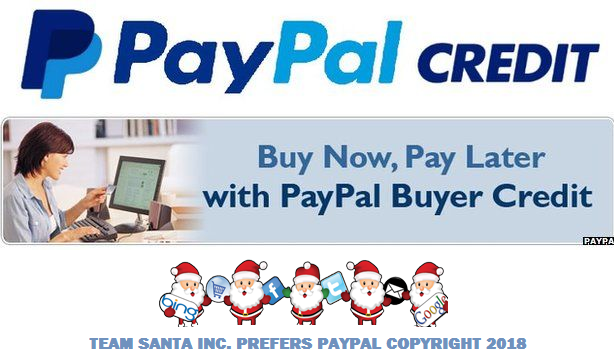 When shopping at a Team Santa Inc. website, click on the PayPal button. That’s all you need to do to start the process today. It’s absolutely painless. We promise! Until the next time..